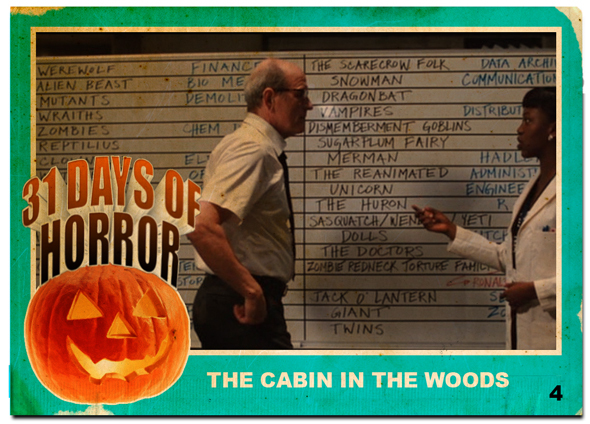 The Cabin in the Woods was Joss Whedon’s entry into the horror genre (outside of Buffy) that gave you a glimpse into the methods behind the madness. It was the movie that came out and showed you exactly why it is that all of the characters in horror movies do the stupid things that ultimately lead to their grisly demise. As it turns out, the deck is stacked against them from the very beginning. Working from underground facilities across the globe a group of scientists, engineers and technicians take part in a yearly ritual. The ritual is designed to appease the “Ancient Ones”. Think of Lovercraft’s Elder Gods, the malevolent deities that existed here before man, and you’d be on the right track. To keep these beings in their perpetual slumber, a sacrifice of five young people must be offered every year. These five young people must embody certain archetypes: the Whore, the Athlete, the Scholar, the Fool and the Virgin. These are stereotypical types of characters that show up time and time again in horror movies. The sacrifices are carried out through random scenarios orchestrated by the senior technicians monitoring the characters progress and take on the familiar machinations of a horror movie. While employing real monsters to carry out the actual murders, the technicians rely on a more scientific approach to put the victims in harms way. When someone suggests that they stupidly split up instead of sticking together, it’s a result of a gas he just inhaled from a nearby vent. When a female character starts acting all whorey, it’s due to something the technicians had added to the dye she recently used to color her hair. Those voices telling you to go outside? A hidden speaker. All the contrivances of your typical horror movie are explained as the hidden almost subliminal guidance of the technicians, luring victims to their untimely ends, for the continued existence of all mankind.